I'll never forget standing in this square and remembering this photo which has is now known as one of the "100 Photographs That Changed the World," by LIFE. "When this young man simply would not move, standing with his meager bags before a line of tanks [in Beijing, China], a hero was born. A second hero emerged as the tank driver refused to crush the man, and instead drove his killing machine around him. Soon this dream would end, and blood would fill Tiananmen. But this picture had shown a billion Chinese that there is hope." What makes this photo even more interesting is that even though we think of China as an open market ecomony (think of all the trading we do with them), just six years ago when I was there, my Chinese tour guide told me that we were forbidden to discuss this incident in public due to secret police lurking around the square. Our tour guide also said that at the time this photo was taken, the Chinese even IN Beijing did not know what was going on in the square nor did they see this photo. When I think of this man and his courage, it makes me realize that one person, just one person, can indeed make a difference. Thanks for posting this Caroline. 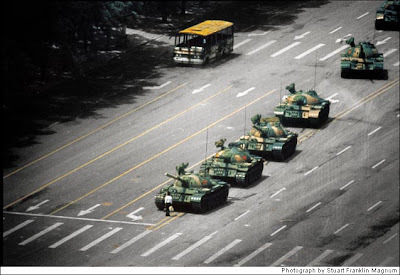 I was in Tiananmen less than a year before this happened, and remembered watching it the following summer, thinking how much had changed in the 10-11 months since I'd been there. I love this photo, and look at it regularly as a reminder of how precious liberty is and what people will do for it. I wonder what happened to the man when the cameras ran out of film, or when the press stopped caring. Advocates of freedom rarely get to see the resulting carnage of throwing themselves on the gears of the tyrannical machine unless it's first hand. We don't know what happened to him and the Chinese government will neither confirm nor deny that he was executed or is still living. You're right, it is a shame that the advocates rarely get to see the impact they make and yet I think that is part of what makes them have such an impact, they were willing and often do give up everything for freedom. Thanks for your comment, very thought-provoking and led me to watch some youtube videos on that event and read some articles on what happened to the "tank man."